Our Micro Series line of compact inverters offer “Big drive” features for adapting standard or premium efficient three-phase motors to adjustable speed operation. They utilize the latest technology in software and power conversion circuitry. They are easy to program and read-out in plain English, eliminating the frustration and time involved in trying to translate symbols. Complete rugged steel enclosures offer protection that is not always provided with plastic enclosures. Built-in thermal overload protection reduces additional costs. Heavy duty wiring terminals and accessible conduit openings reduce installation time. 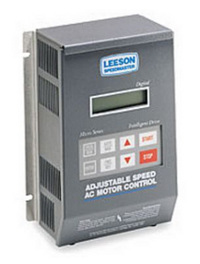 PURCHASE YOUR LEESON MICRO SERIES – AC INVERTERS NOW!